This is the first blog post I write in a few months, I missed it! I have recently completed a project involving satellite image classification and it has inspired me to write a post. Today, I will be talking about convolutional neural networks which have gained a lot of attention especially for computer vision and image classification. ​They are highly proficient in areas like identification of objects, faces, and traffic signs apart from generating vision in self-driving cars and robots. All the advanced vision technologies you see out there (robots, machines, self-driving cars to name a few) are probably using these types of neural networks to achieve their goals. Guess what? You will actually learn how it works and have a rough idea about what is going on. I will try to explain it assuming that you have just a rough idea of what machine and deep learning are. ​As stated earlier, Convolutional Neural Networks (CNN) represent a type of neural networks. A neural network is simply a "mechanism" vaguely inspired by the biological neural networks that constitute animal brains. The neural network itself is not an algorithm, but rather a framework for many different machine learning algorithms to work together and process complex data inputs. Such systems "learn" to perform tasks by considering examples, generally without being programmed with any task-specific rules. In our case, the goal of CNN would be to use images to either detect specific objects, extract relevant information (such as face recognition), perform image segmentation and so on. The images below show object detection and image segmentation using CNN, where one can notice how accurate it is. Before diving into the how the CNN actually works (intuitively without detailing the mathematics), we first need to understand how an image is represented in the computer, how this neural network sees an input image. When a computer takes an image as input, it will see an array of pixel values. For example, let's say we have an image in JPG form with size 480 x 480. The representative array will be 480 x 480 x 3 (3 refers to the RGB values). Each of these numbers is given a value from 0 to 255 which describes the pixel intensity at that point (assuming it is an 8-bit image which is the standard). These numbers, while meaningless to us when we perform image classification, are the only inputs available to the computer. Now that we know how a computer sees an image, we want to extract information from it. As human beings, seeing which is a dog and which is a cat is a fairly easy task, however for a computer it really is more complicated than using only numbers as inputs. What this neural network will do is take the image, pass it through a series of convolutional, nonlinear, pooling and fully connected layers to get a certain output. 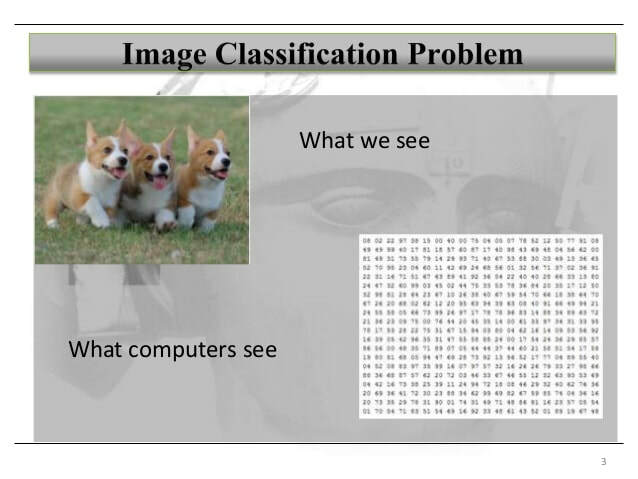 The output can be a single class or a probability of classes that best describes the image (example of classes can be human, dog, cat, horse etc). In the example below, we see that the neural network predicts that this image represents a cat with a probability of 82% which is quite accurate. However, you will see that using it will start by being not accurate and will "learn" how to correctly predict an image. The final goal would be to predict it with 99-100% accuracy. Neural networks are made of layers which contain neurons. The particular architecture of the layers constitutes a very important concept because different types of layers yield different learning types. In this section, I will describe the basic architecture used by CNN. Of course, a number of optimization techniques can be applied, but we will stick to the basics. Convolution is one of the main building blocks of a CNN. The term convolution refers to the mathematical combination of two functions to produce a third function. It is highly used in the field of signal processing. In the case of a CNN, the convolution is performed on the input data with the use of a filter (also called kernel) to then produce a certain result called feature map. We execute a convolution by sliding the filter over the input. At every location, a matrix multiplication is performed and sums the result onto the feature map. The Rectified Linear Unit (ReLU) is a non-linear function used after the convolution layer. It is extremely important to remember that this function is not linear. Since most of the problems we deal with practically are not linear (otherwise life would be so easy), then by applying a non-linear function we generalise our problem to non-linear problems as well. This function acts as an element wise operation (applied per pixel) and replaces all negative pixel values in the feature map by zero. If we wish to reduce the dimensionality of individual feature maps and yet keep the crucial information, we use the Pooling layer after the Convolution layer. Different types of Pooling exist: Average, Sum, Maximum, etc. For Max Pooling, we first specify a spatial neighborhood (such as a 2×2 window) and then pick out the largest element of that feature rectified map within that window. Instead of largest element, if we pick the Average one it’s called Average Pooling and when the summation of elements in the window is taken, we call it Sum Pooling. How does it compute the result? As I stated earlier, neural networks are made of layers, in which we have nodes representing neurons (similar to the brain). Between those layers exist edges (some sort of connections, again similar to the brain) that have weights or filter values. Those filter values need to be updated each time to produce better results, using what we call backpropagation. Before the CNN starts, the weights or filter values placed in the connections are randomly initialized. Let's assume we have a training set that has thousands of images of dogs, and cats and each of the images has a label of what animal that picture is. The final goal is to have those weights be numbers in such a way that the label given in the training set matches the label. 1. Initialize all filters and parameters / weights with random values (as discussed above). 2. The network takes a training image as input, goes through the forward propagation step (convolution, ReLU and pooling operations along with forward propagation in the Fully Connected layer) and finds the output probabilities for each class. This error is called the mean squared error (MSE) since it uses the square function. Other loss functions can be used as well, but this is a popular one. 4. Use Backpropagation to calculate the gradients of the error with respect to all weights in the network and use (stochastic) gradient descent to update all filter values / weights and parameter values to minimize the output error. The weights are adjusted in proportion to their contribution to the total error. When the same image is input again, output probabilities might now be [07, 0.3], which is closer to the target vector [1, 0]. This means that the network has learnt to classify this particular image correctly by adjusting its weights / filters such that the output error is reduced. In summary, CNN is a type of neural network that is based on the idea of convolution. By using a convolution layer along with other types of layers, it can learn how to perform object segmentation or detection. However, CNN does not stop at images! It is also widely used in natural language processing. If you are interested in creating your own convolutional neural networks, I highly recommend the Keras library. It is a very intuitive Python library that uses TensorFlow and can help you learn neural networks in a practical way. I love reading books. In fact, one of my 2017 resolutions was to read at least one book per month, which meant a minimum of 12 books a year (which is a success until now). I am extremely passionate about self-development books, they have a unique style to inspire me and probably a lot of people in the world. I started these books at the age of 13. Since then, I have never stopped being in love with them. Today, I will be giving some of the lessons I learned in the past years. Unfortunately, nowadays it is extremely easy to get distracted. We have to keep an eye on so many different things, which eventually leads us to losing focus. Reading is one way to improve it. When we need that concentration right away and it just doesn’t come that easy, reading is the ultimate solution. The way reading grabs our attention is a cure for our ability to focus and our concentration skills. When reading a book, one needs to remember an assortment of characters, their backgrounds, ambitions, histories, and nuances, as well as the various arcs and sub-plots that weave their way through every story. As a result, every new memory created forges new synapses (brain pathways) and strengthens existing ones, which assists in short-term memory recall. (such as preventing dementia and the Alzheimer). And it influences our brain while rapidly improving our memory. Have you ever read an amazing mystery novel and solved the mystery yourself before finishing the book? If so, you were able to put your critical thinking skills to work by taking note of all the details provided and sorting them out to infer things by yourself. That same ability to analyze details comes in handy when it comes to critiquing the plot, determining whether it was a well-written piece, if the characters were properly developed, if the storyline ran smoothly, etc. Should you ever have an opportunity to discuss the book with others, you’ll be able to state your opinions clearly, as you’ve taken the time to really consider all the aspects involved. Even in real life, critical thinking skills are essential. Being able to solve problems given certain elements are a part of daily life – from finishing a project for work to figuring out how to navigate difficult relationships, possessing critical thinking skills are necessary in all walks of life. This benefit seems trivial (and it is), but we tend to forget how important this is for the health of our brain. The more you read, the more words you gain exposure to, and they’ll inevitably make their way into your everyday vocabulary. The fact that you articulate well, speak with a good vocabulary gives more you more confidence as you speak, and that can only be beneficial. Moreover, this could be helpful when learning new languages. Indeed, if you read a book in a language that you are trying to learn, this will teach you new vocabulary, therefore making you better at speaking that language. 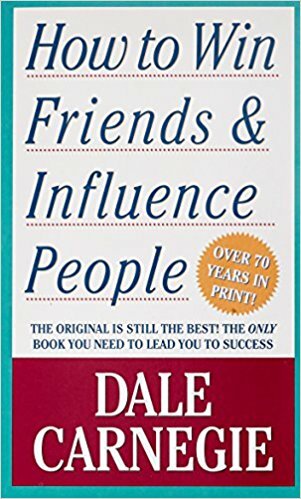 Back to specific books, the first one I read in terms of self-development , which is still until now my favorite one, is called: How to Win Friends and Influence People by Dale Carnegie (originally published in 1936). This book is simply a master piece that teaches you everything you need to know about social skills. It taught me so much, and I use its lessons every single day of my life. Do not condemn, and do not complain! This is a very powerful message that the author starts the book with. Dale Carnegie tells us that, instead of condemning people, we should be understanding them. We should understand what motivated them to do a certain action. This is much better than criticising and condemning. He states: "God himself does not give a judgement to people before death. How dare we?" We have all been in a situation where we either criticised or judging someone on his acts, then realising that we were all wrong. "Any fool can criticize, condemn, and complain — and most fools do," Carnegie wrote. "But it takes character and self-control to be understanding and forgiving." We should stop thinking about ourselves, our desires, what we want and what we need. Let's start thinking about the others; their desires, what they want and what they need in a very sincere and helpful way. Think about those cute little dogs that come run to you when you go to guest's house. Those dogs did not read any single book, nor practised any of these principles I am describing, but somehow they make you feel welcomed and loved. If you want others to feel the same way around you, do like those dogs. Forget yourself, think about others because you will make more friends in two months being interested in others than in two years talking only about yourself. Listening closely to someone "is one of the highest compliments we can pay anyone," Carnegie wrote. When we know we are right, we should share it in a respectful and humble way. However, when we are wrong, we should acknowledge our mistakes. Not only this will show better results for the relationship in question, but it is also much more entertaining then trying to justify ourselves. Even if you manage to tear apart someone else's argument, you don't actually achieve anything. Carnegie cited an old saying: "A man convinced against his will/Is of the same opinion still." If you're looking to actually persuade somebody, avoid an argument in the first place, he said. I only gave a few lessons, the book itself shows exactly 30 lessons, or "principles" and I strongly advise everyone to have a look at them at least once in a lifetime. I hope this motivates you to read the book because, as I said, it is a real master piece! Whenever you try to find some of the best life tips that have instant benefits, exercising is one of those tips that usually comes at the top. Now, people tend to think that others exercise to have a "body summer" or to just "look good". However, exercising has by far greater importance than just the esthetics. 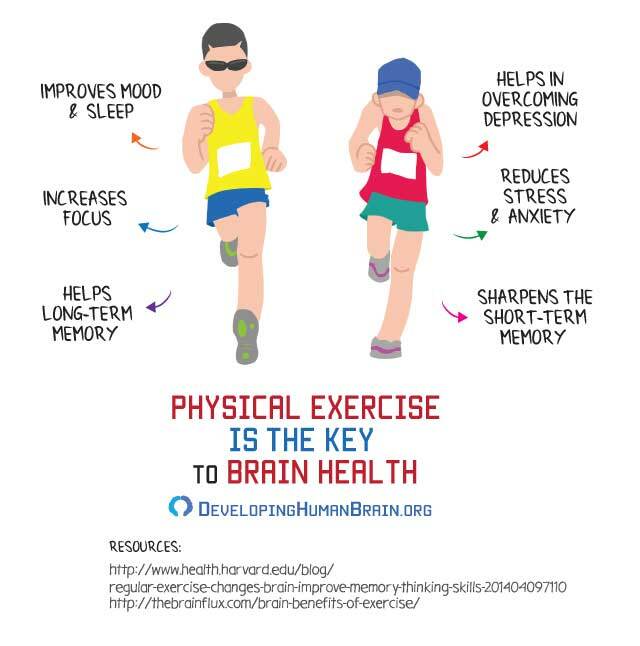 Most importantly, exercising has an amazing benefit on your mental health.​ In this article, I will be highlighting the most important benefits that exercising has on your brain. The ability to control our emotions is a very important skill of cognitive control. Whenever you reign in an outburst of anger, or continue your day despite feelings of sadness, you are exercising emotional regulation which may or may not transform your good day into a bad one. Scientists wanted to track changes in self-regulation. So they conducted a 2 month long study where participants are exposed to a program of regular physical exercise. The researchers noted a number of positive changes in behavioral patterns. Among these was a decrease in emotional stress and an increase in emotional control. If you have a tendency to blow up at people or lose your calm, exercise can help you keep centered. This can make a huge difference in the daily life. There is a strong link between regular exercising and improved memory. One study found that 35 minutes of interval exercise on a bike strengthened long term memory. The timing of the exercise was important. Better memory was found for subjects who exercised four hours after learning. No benefit was seen for those exercising immediately after learning. Interesting right? Another study split participants up into three groups. Each group was told to recall as much information as possible from two paragraphs. The first group received the information after exercise, the second before exercise, and the last completed no exercise. They found that the group that was exposed to exercise before being given the information performed significantly better at recall than the other two groups. This benefit is a well known psychological benefits and one of the biggest reasons why people start exercising. The science behind it is well documented, as well as it’s calming effect on a stressed mind. From a psychological perspective, exercising gives a way to distract yourself from focusing on daily stressors. This could be from teachers, bosses, romantic partner (hopefully not) or any number of personal problems. When the mind has nothing else to focus on, it will drift. Many people can fixate on immediate issues, specific stressful problems, or strong emotional feelings. So exercise can simply give you an immediate task to focus your energy on. So while this benefit of exercise is not a surprise, it is still one of the best, time tested reasons to get out there and get moving. exercise is an efficient stress management technique. Depression is one of the most common mental conditions that affects people worldwide. It is also one of the biggest (direct or indirect) causes of suicide worldwide. The National Institute of Mental Health (NIMH) estimates that 16.2 million U.S. adults had at least one major depressive episode in 2016. This represents 6.7 percent of the U.S. adult population. A large meta-analysis analyzed the effect of exercise on alleviating symptoms of depression. Two things were found from the review. First, positive results from a significant and moderate relief from depression. The second result came from the comparison of exercise to other forms of psychological therapy or drugs. Exercise was found to be just as effective as the other alternatives. I am pretty sure that for those taking pills everyday, it is time to review their decisions because exercising can be a much cheaper and equally effective way to treat their problems. In psychology, the term self-esteem is used to describe a person's overall sense of self-worth or personal value. In other words, how much you appreciate and like yourself. ​Self esteem is important if we want to live a happy life. Low self esteem creates stress, depression, and anxiety. Also, it can negatively impact our job and academic performance. If gone unchecked it can also cause a number of other unhealthy behaviors. Exercise has been shown to affect self-esteem positively in all ages. From your development as a child up until the twilight years. A large quantitative review of 113 studies reported finding a change in self-esteem through exercise. In fact, the more physically fit one was, the higher one’s self esteem. One final result reported was that the type of exercise program could also affect the level of self-esteem. Sleep is one of the major areas of efficient brain functioning. It has a direct effect on memory, self regulation, and cognition. One study looked at adults that had numerous complaints about lack of quality sleep. The study examined several factors. Gender, age, and physical function were observed over a period of 12 months. The results found that adults that were the least active benefited most from exercise when it came to quality of sleep. Exercise can do more than help those with insomnia or sleep disturbances. It’s good for normal healthy adults and adolescents as well. A meta-analysis found that total sleep time and fewer disturbances during the night were positive side effects of acute bouts of exercise. It’s important to note, the relationship between sleep and exercise has had some varying results. A lot of the variation has occurred when subjects have known sleep issues such as insomnia. Typically, exercise in the long term has beneficial results. Certain variables like the type of exercise, duration, and intensity are still being explored to find the cause of certain types of research results. Exercise impacts more than your academic or personal life. It can also have a positive effect on your professional life as well. Over 200 white collar workers from 3 organizations were used to study exercise in the workplace. Researchers found that people reported several positive effects in the workplace from working out during their break or if they exercised before work. The benefits included better time management, better mood, and increased employee tolerance. On days were employees didn’t exercise, the benefits were not seen. Another study from Bringham Young University looked at different factors that contributed to the loss of productivity in the workplace in almost 20,000 employees. Researchers found that people who exercised only occasionally or not at all were more likely to report lower productivity than employees who exercised regularly. That's it for my article! Of course, exercising has much more ​benefits, but I chose to share this with you. Personally, I try to exercise at least 4 times a week, and that has amazing results. I strongly recommend everyone to do the same. This is my first blog post in 6 months, honestly I was extremely busy with graduate school applications. However, I plan to be back in writing blog posts more frequently. As you can see, the red LEDs are extracted (we discard the green color in our example). In order to be able to apply circle fitting, the edges of the detected image need to be extracted, which is done by using a Canny edge extraction. This canny edge extraction is a built-in function inside OpenCV. Great, now we have detected the ellipse as needed and have some important values such as the angle and k. Now, in order to get the position in cartesian coordinates, it becomes a little tricky. 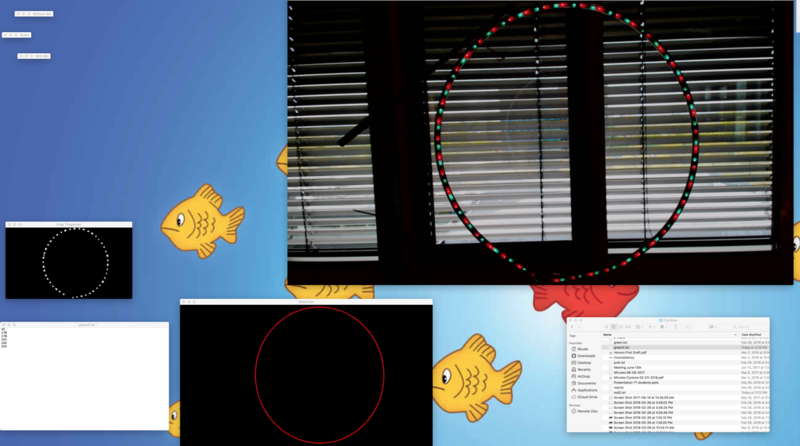 Here, we assume that the origin is the center of the hoop, x is the horizontal axis (left and right from the center), y is the vertical axis (up and down from the center) and z is the axis from the camera facing the center of the hoop. We wish to determine the relative position (x,y and z) of the hoop with respect to the camera, where the origin is the center of the hoop. α2: Angle of rotation about the camera frame's vertical axis between the disc axis and the horizontal direction of view of the camera (0 = no rotation; 90 degrees = viewed left edge-on, disc facing right). This is the horizontal angle. β2: Angle of rotation about the camera frame's horizontal axis ('lie back') between the disc axis and the real world horizontal plane (0 = no rotation, disc is vertical; 90 degrees = disc is flat, facing up). This is the vertical angle. D: Distance from the camera to the center of the hoop. where F is the focal length, R is radius of the hoop in meters, D is the distance at which the reference shot is taken and P is the representation of the radius of the hoop in pixels in a captured frame. where pmajor is the semi-major axis of the perceived ellipse. The math behind this is a bit complicated so I will avoid going into the details. And that’s it! If the assumptions stated at the beginning of this post hold, then the output results should be correct. A small trick: This method proved to be inaccurate sometimes when looking at the hoop from the center (where x and y should be nearly 0). This is due to the fact that the tilted angle returns inaccurate result because the detection does not know which axis is the major and which axis is the minor. Hence, whenever k (remember k is the minor axis divided by the major axis) is nearly 1 then we can assume that the ellipse is a circle, and thus that we are looking at it from the center. As a result, we can then assume that x and y have a value of 0. This is not the best way to fix this, but it works for most of the cases. I think this is the fifth blog post I talk about VR. I just can't help it. It is just such a passionate subject. I was walking in MediaMarkt store here in Eindhoven, and saw all the new virtual reality headsets being sold, so it inspired me to write this blog post. The thing is, to quote Jay Borenstein from Stanford CS department: “If you believe that VR is coming… that it’s going to be transformative, that it’s going to be ubiquitous, and very significant for the way that society interacts with one another, then it’s exciting to be at the very early stages.” And yes, I believe in this, I am more than excited to be at the very early stages. As you may all know, Facebook, Google, Sony and a lot of big companies are working on it. What you might not know is that there are a lot of small start-ups as well, so many VR headsets that are not as famous as the Oculus Rift or the HTC Vive. I talk more about this in my post about the Game Developers Conference 2017 that happened in San Francisco, California. Today, I will not be talking about the technology behind VR, but rather how to get into that world. Why don't I apply all these strategies? I am trying my best to do so, by working on VR with a PhD student, writing these posts and making my own research on this subject, but I am also extremely busy with studies and graduate applications as well as sports. ​Science fiction writers and futurists dreamt up VR decades ago, and hackers have been attempting to build it ever since. Today, the technology is rapidly advancing with the promise to shift modern computing into a new paradigm, not unlike smartphones did one decade ago. Some people are skeptical about whether VR will stick around, because the technology is still very much plagued by issues like high cost, unwieldiness, and simulator sickness. But I strongly believe that this will be resolved with time, and investments. Is VR a new technology? And that is true, the technology was being developed since the 1960s. Only recently have developments in VR become more visible to the public eye. CPU/GPUs have reached a point where they can provide high-fidelity, immersive experiences for reasonable prices. Smartphones have enabled mobile VR as cheaper and more accessible options that don’t require you to be tethered to high-end computer. As more people have an opportunity to try VR, it’s becoming increasingly clear how the technology might reach consumers in a big way. I mean, when you first think about VR, it is about driving cars in video games, destroying robots and infiltrating military camps. Those things are really fun, but there is a lot more than that.. and that is what makes VR so interesting. But VR will also enable immersive concerts, reinvented museums, and live, court-side sporting events. With VR, videoconferencing will improve, with better eye contact and the inclusion of nuanced, non-verbal cues. The cost of training will plummet without the need for human trainers in industries like construction or manufacturing. At the same time, the efficacy of repeatable, hands-on training will increase. Academics will conduct social psychology research with more reproducibility, diverse sample sizes, and day-to-day realism without the need for human confederates. VR will provide a scalable way to introduce true experiential learning into education. Electronics: How can we optimize devices that we put on our faces for batteries, heat, and size? Hardware: How can build haptics for better tracking and feedback on our bodies? Computer Vision: How can we bridge the real-world and VR with 3D reconstruction and scene understanding? Artificial Intelligence/Natural Language Processing: How do we create realistic agents to interact with us in VR? I have some AI and Computer Vision practical knowledge already from my studies, but look to dive deeper into them in the future. My point here is that any experience in one of these fields will you get into the VR world. Psychology: What are the effects of VR on addiction? What are the effects of avatars on identity? Sociology: What will it mean to have transformed social interactions (think automatic eye contact)? Download a game engine, like Unity or Unreal Engine, and start hacking. I have the chance to have extended Unity experience, and hope you also do! Otherwise, it is never too late to start learning! Usually, the game engines are very intuitive and it is not too hard to learn the basics, mastering them is something else. Computer Vision: How can we track and understand depth? Computational Imaging/Photography: How does light enter a camera and form an image? Analogously, how can we focus virtual images on our retinas? This is very similar to Game Development, everyone wants to build the next Call of Duty as a first project. Check my project, it was a simple space shooter 2D, and it was a great learning point! Try to embody the perspective of a beginner: be willing to learn and absorb. Don’t start something because you feel like you have to. Now is a great time to learn, experiment, fail and become part of an amazing community. I honestly believe that this is my main strength, I always go talk to professionals. Don't be shy. During GDC 2017 in California, I talked to senior software engineers from Oculus, Facebook, Google, Unity and senior programmers from Treyarch, Psynox, Infinity Ward etc.. Because you don't lose anything by doing so, all you do is learn. The process of building a beautiful experience requires the work of not only engineers, but artists, designers, and storytellers as well (game developers will understand this). Ask for feedback in online forums. Join clubs. Work at a VR company. The world of VR is still very small, and that’s really special for someone looking to make a big dent in the field. A bright future is coming, let's make sure to contribute to it! In the week from 28th of February 2017 to 5th of March, I flew to San Francisco, California to attend the Game Developers Conference (GDC) 2017 happening in the Moscone Center and visit my brother who lives in the same city. Attending GDC has a been a huge dream for me, as I have followed it for the past years through Twitter. Without hesitation, I went there to see the latest in the entertainment industry and listen to talks from companies investing on gaming platforms and infrastructures (Google, Facebook, Amazon to name a few). It was one of the best experiences in my life. I fell even more in love with the gaming world, not just the content but the whole world being built around it, namely Virtual Reality and Augmented Reality. After spending more than 15 hours in the event talking to people from all companies and studios, here is an overview of it. Yes I know, I said this a bunch of times already! ​I wrote a bunch on VR explaining how it represents the future, but this is different. In the expo, nearly EVERYTHING was about VR. It was like heaven for me, literally heaven. I was walking there like a little kid, fascinated by everything around me. You put your eyes up, and all you read is "PlayStation", "XBOX", "Google", "Facebook". I attended different tech talks, 2 from Facebook and one from PlayStation. It was interesting to see how facebook is putting so much money into gaming, not game development, but rather into the platform (instant games, gameroom). Google is doing something different, they are more into analytics rather than ads and platforms. I also talked to some people from Naughty Dog (Uncharted), Treyarch (Call of Duty), Psyonix (Rocket League), Oculus, PlayStation and were all telling me how it is to work at their companies. This is Facebook and Oculus hubs, where Oculus was making the Robo Recall tournament and showing the demos of other games. Facebook was mostly there to give tech talks, give Facebook swags (cool right ? ), and recruit. Having seen the GDC, my perspectives and opinions changed quite a bit. Before this, I wanted to become involved in Game Development (Programming mainly), working in game studios. Now, even though I still want to do that, GDC expanded my horizons. I realized I also want to enable game developers to do their job and provide awesome interactive experiences to players. I saw so much potential there, and started thinking about specializing in Human-Computer Interaction, Software Engineering in VR companies such as Oculus. Of course, the entertainment industry is still where I am heading (and that will hopefully never change). GDC did expand my horizons, offering me a broader vision and more opportunities to consider for my future. It was kind of funny to see Unity and Unreal (Epic Games) battling and trying to get the maximum of players. I spent some time talking to the analytics team and met their product manager. He explained to me their plans for the future in terms of data analysis. It was also funny to see XBOX vs PlayStation and Google vs Facebook. As a passionate game developer, I focused on trying the maximum of knowledge from every company. A photo of the PS VR + Aim Controller is part of this slide show. Last year, I spent a week living on the campus of Stanford University. This year, I had the chance to visit the campus of UC Berkeley and Facebook HQ in Menlo Park, and all of them were really, really amazing! Technology... it just never stops growing. Amazing things happen every single day. You wake up, a Google robot beats the Go game world champion. You wake up, Amazon demonstrates Amazon Go, which is a grocery store without check out using Computer Vision, Deep Learning algorithms and other complex stuff. What is happening there in the Silicon Valley (and everywhere in the world) transforms the world into a sort of a dreamland for those interested deeply in technology like me. I currently work as a VR Game Developer in the Game Lab here at the TU/e and doing research on how to create empathy through VR experiences. Sometimes I meet people that are more interested into Augmented Reality (AR) and we start arguing about who will take the other in the future. I honestly believe that it will be the next big technology battle, where different big companies will invest into one of them and start developing crazy stuff. Microsoft is already investing a lot on the HoloLens, which is "the first fully untethered, holographic computer, enabling you to interact with high‑definition holograms in your world." This means that Microsoft is in the Augmented Reality side. On the other hand, there is Facebook who acquired Oculus currently building the Oculus Rift. Moreover, there is HTC and Steam, working together on the HTC Vive. Both of these headsets are Virtual Reality headsets. This shows that tech battle already started. Both AR and VR are not yet consumer ready: Yes, they are being sold and shipped, but they are still too expensive and not perfect yet. Those who possess them are usually developers and huge VR or AR enthusiasts. Of course this will not last for long, I believe that in 2-3 years, everyone will start buying the headsets at home for them or their family and friends. Mark Zuckerberg, the man who spent $2 billion of Facebook's money on Luckey's VR company Oculus, is a huge VR enthusiast: "We're working on VR because I think it's the next major computing and communication platform after phones," he said in July 2016. "we'll have the power to share our full sensory and emotional experience with people whenever we'd like." Both Virtual Reality and Augmented Reality are similar in the goal of immersing the user, though both systems do this in different ways. With AR, users continue to be in touch with the real world while interacting with virtual objects around them. With VR, the user is isolated from the real world while immersed in a world that is completely fabricated. As it stands, VR might work better for video games and social networking in a virtual environment, such as Second Life, or even PlayStation Home. On top, you can see the Microsoft Hololens and in the bottom the Oculus Rift headset. In terms of experience, they both differ a lot. AR is more about wearing something light such as glasses while VR is about wearing a huge headset. While AR will eventually be neatly tucked into the sides of your sports sunnies, though, VR is always going to have to enclose your eyes and ears with lenses, displays and headphones to work. AR glasses will cause etiquette problems as they 'disappear' whereas VR will go the other way with us very clearly 'plugging in' to a virtual world for a session. With pass-through cameras there could even be some kind of hybrid wearable that offers both. In general, AR specs are lighter and more comfortable than VR headsets and they are more likely to be wireless. This is important because, at least for now and the next few years, no one will go out in the street with a heavy headset, but going out with a modified glass is possible. What I am saying is that I see VR more as a technology where the person stays home to play video games while AR will be much more there outside. Now, which of the two technologies represents the future ? ​This is really the question of whether humans want what they experience in the future to be based in well, reality, or constructed, artificial and cut off from what we now refer to as reality. That's a big question. We're social creatures. So you might think VR has a slight disadvantage - augmented reality demos such as HoloLens' Halo 5 demo allow a group of users to stand in a circle around 'holograms' simultaneously. But steps are already being taken to make VR more social - Facebook is betting big on it and we are beginning to see real investment in platforms which allow virtual hangouts such as AltSpaceVR. And look no further than at art projects such as the telepresence installation Me and My Shadow which connected visitors from four cities in a virtual space. Neither of these technologies is as passive or as social in a physical location sense of the word as say, hanging out half-watching TV. And this could be a big factor. To play a game or experience on Oculus or HTC Vive, you have to commit yourself fully. And VR is thrilling and entertaining enough that gamers will do this, not to mention students, say, getting their heads around anatomy. 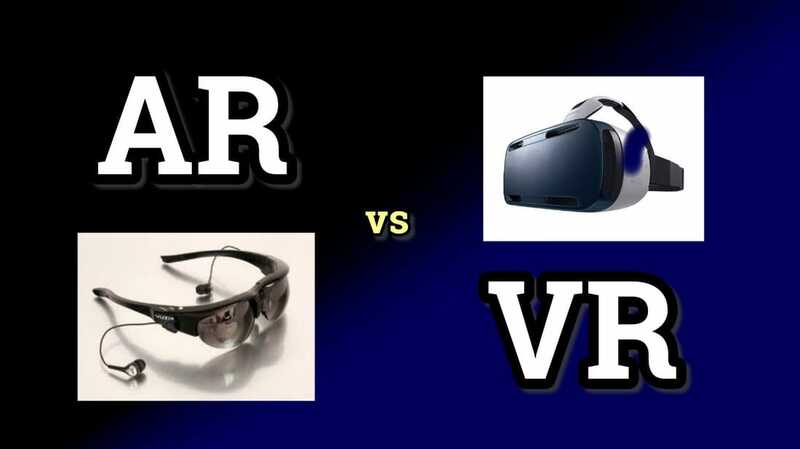 Perhaps the difference will be VR as an at-home treat, as console gaming or kicking back to a Blu-ray is today and AR for more of a social, everyday experience that doesn't take you away from smartphone alerts, walking down the street or playing with your kids. The answer, then? Well, it's both isn't it? Serious games are getting more and more popular. They are a source of education, motivation and I have had the chance to work on one already. My project was about getting people to change their minds of nuclear energy in favor of Sustainable energy. I am pretty sure that it will get much more importance and will have a bigger impact on the world, especially with the rise of VR. But first, let's define serious games! A game designed for any purpose rather than entertainment. Serious games are considered useful to those who wish to use simulation for training and education e.g., flight simulations. They also make use of games engines, a good platform for development and play. That is where the "serious" expression comes from: education, persuasion, motivation or whatever is other than entertainment. It is quite hard to imagine them for some people, because games are usually seen as "fun". Thing is that, they can be both at the same time. However, in this case, being fun is not the most important thing for the game to have. Point number 2 enhances points 3 and 4: it goes without saying that the fact that traditional education is under-performing in some parts of the world leads to seeking a change, a new way of learning: games. Now that we have covered a bit about serious games (currently developing one), one idea came to my mind not a long time ago, and I will start working on it just after publishing Shapion on mobile. Here, I will give a quick overview of it and the reason why it can be amazing to develop it, without going too much into details. Today, Youtube possesses more than 300 motivational videos with up to 35 million views , and this number is increasing daily. Watching motivational videos is becoming a well-known advice in order to help people overcome failures, loss of motivation and social difficulties. They are a strong tool in helping humans achieve their highest potential, accomplish more than expected, and visualize success. Moreover, most of the well received speeches are the ones about past failures. For instance, Steve Job’s speech at Stanford University (2005) is considered as one of the best speeches ever made. Another example is J.K. Rowling’s speech at Harvard Commencement (2008). What if we enhanced this motivation by making people live these videos as experiences instead of just being a simple Youtube viewer? What if games can foster learning life lessons? In this section, I will be presenting motivational games as a new type of serious games. The informations highlighted in the first part of this paper will guide serious games to a great design, a great user experience allowing players to be truly satisfied. "Game Over" never means game over. It means press start and try again. A gamer’s video game history is plagued with failure. So many missed leaps, bad timing, and shots to the head. This doesn't mean he gives up, though. Failing in a game just sets him up for success in the future. When confronted to different paths, usually in games including adventure, a player knows midway though the taken path whether he took the correct one by looking at the number of enemies coming in his way. By making an analogy with life, one can understand how it relates to the path we take in terms of career or even relationships. ​One last example that is deeper, emotionally appealing to humans is Journey. In this multiple awards-winning PlayStation game , the player controls a creature in a beautifully crafted desert with one goal: go to the top of the mountain. The studio stated their interpretation of the meaning life with this game. It is in the title, and it is there until the end of the game. The meaning of life is to never truly know the meaning. All that matters is the Journey you make to discover it. From the beginning of the game you have no idea where you are or what your reason for even being there is. You are basically a newborn, and you are about to enter a beautifully mysterious world, much like the lives we live. Then your creature travels on, learning more about itself, and its culture, and the history behind it. Much like a child. Then at sunset you discover true beauty. You surf over waves of sand that might as well be water. The analogy could be made with your first steps into the world as a young adult. You seek adventure and find things you have never seen before. Then darkness falls, and your delve into the underbelly of Journey's world. It is a dark and scary place down there. Just like the challenges of adult hood. Then you surface and enter the cold unrelenting wind. It blows you backward, but you continue on. This is much like the hindrances of old age. Then you reach the brink of death. There is no beauty, just hopelessness, but you are given a second chance to complete your quest. It's almost like surviving a heart attack. Then peacefully, on your own terms, you walk slowly into the light accepting your fate. As a player, you never knew for sure what your true purpose in life was, but you're at peace with that. Because you have seen such amazing beauties that you do not need a sentence to describe your true meaning. The meaning behind Journey is that there is beauty in life, in triumph, in fear, and in death. You just have to slow down and realize it. My point through these examples is that the meaning of life and life-lessons are not meant to be said only, but they have to be experienced. In the first two examples, those lessons were taught un-directly. What if we design these motivational games to teach them directly? Journey is a 45-min game that won multiple awards including best PS3 game and came in front of the AAA games such as FIFA, Call of Duty, Assassin's creed and so on. If a 45-min game explaining the meaning of life made this impact, what if we adapt Paulo Coelho's "Manual of Warrior of Light" or "Like a Flowing River" into 2D games with a length of 5-10min ? For those who have read these books, we all know that reading them when feeling bad (pressure, depression, failure..) creates such an amazing feeling that makes us feel alive again, and those are only words. ​Experiencing it would make it much much better. I am confident that this type of games has a huge potential with VR, and it is time to start building them from now. When you read some of the important skills one has to develop, you often read: "learn how to learn". For some people, this may sound weird. Yet, it is fundamental to our development. I have always had this problem to memorise information instead of learning. One day, as I was reading some answers on Quora, someone asked: What is something unusual about you ? An answer showed up, the best answer among all the others for that question. I cannot remember the exact words, but these sentences stayed in my mind the whole time: "I don't study. Seriously, I don't. The key is to learn, people tend to memorise. I learn". Well, you could say that for a high-school student, it is easy to answer like this. The material covered is still simple. This person was doing a PhD in Mathematics at MIT. DIFFUSED MODE: it is a more relaxed thinking state, one the the brain settles into at resting. One way of imagining it is the FLASHLIGHT ANALOGY. This involves visualising your brain as a flashlight: Diffused mode of thinking could be thought of as a setting on the flashlight designed to cast a broad light not very strongly, while focused mode would cast a very strong light in smaller area. Now, why am I talking about these ? It is important to know how to joggle between both of them. Did it ever happen to you to focus on a problem, not find a solution, then you take a break and during that break the solution just comes to you ? That is because you joggled between both of them. Sometimes, I wake up at 3am, my mind solves an algorithmic question, then come to sleep. Funny right ? Learning in focused mode is usually what people think of when hearing the word “learning.” It is using our focused attention to think solely about the information we are trying to learn. During focused mode thinking, we are sitting down and deliberately practicing something or trying to solve a problem, without distracting ourselves with anything else. When you are sitting down and writing a paper, doing a math problem, or practicing a specific dance move, you are in focused mode. The focused mode can be thought of as the foundation of knowledge, laying the initial memory traces for us to form our knowledge base. The focused practice and repetition of triple axles, free throws, roundhouse kicks, math problems, or vocabulary is what allows us to build a foundation of knowledge to ultimately apply it to what we are ultimately learning to do—whether it be figure skating, playing basketball, doing karate, acing a math examination, or learning to speak a foreign language. Focused mode learning is centered in and around the prefrontal cortex, the area right behind the forehead. The prefrontal cortex is responsible for much of our executive functions that has to do with decision-making and problem-solving, in addition to controlling our attention and memory. ​Unlike focused mode, diffused mode doesn’t seem to have one central area in the brain that is mainly responsible—it seems to be a division of labor of multiple areas of the brain. When you are trying to grasp a new concept, you do not have a preexisting neural patterns to help guide your thoughts—there is no fuzzy underlying pathway to help guide you. This is when diffused mode becomes handy. To further explain the difference between focused and diffused, it is useful to use the flashlight analogy used in the book. When you are in focused mode, you are shining a flashlight that is tightly focused on one small area. However, when using diffused mode you are casting the flashlight in a broad area, with the light not shining brightly in any one specific area. When you are in diffused mode, you are not intently focused on so-called deliberate practice. Rather, you are just letting the limited knowledge run in the background, kind of like background programs running on your smart phone while you actively use one program. Thinking in diffused mode can be done by just playing a game of basketball if you are learning how to be a better basketball player, by playing random chords on the guitar if you are learning how to play the guitar, or just mentally thinking about math problems while taking a walk. 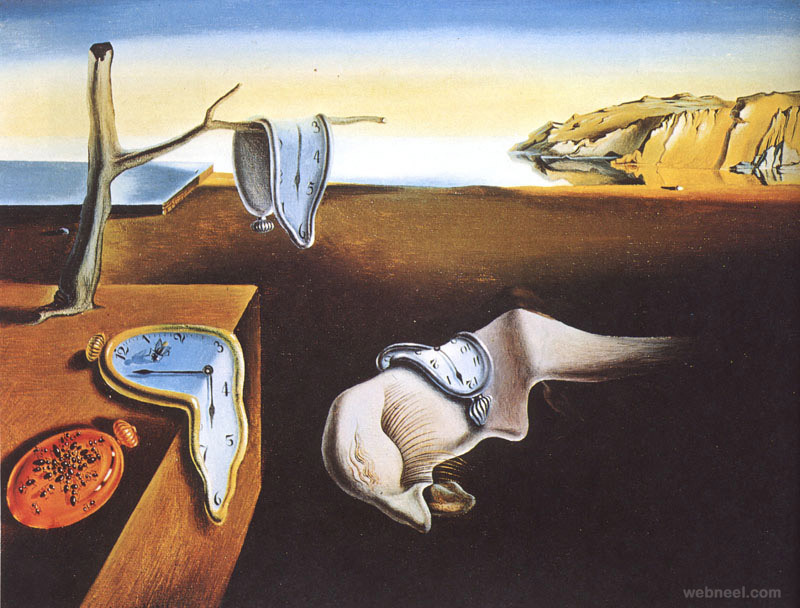 This surrealist painting is called the "Persistence of memory" and was painted in 1931. I will leave all the art analysis, as it is not my goal here. However, any person interested in art should check its analysis. It is a masterpiece. Now, let's come back to our initial point: Salvador Dali was said to relax and drift off to sleep with a key dangling and upon his dozing off to sleep he would drop the key, it would jangle and startle him awake. This is an example of Dali bouncing between thought modes. He would clear his head and relax his mind until sleep came, entering the diffuse mode, then he would wake up and drag all those wonderful diffuse mode ideas back the focused mode and the results were brilliant works like the painting above. I hope this example gives more insight to the joggle of both modes. Ask yourself: What is it you want to learn or master? You must answer this question as specific as possible. Many people make the mistake starting to learn something without knowing what EXACTLY they want to learn. When you know what you want to learn your brain focuses on that outcome and searches for it actively. A defused light has little power, but light focused like a laser beam has the power to cut through steel! Not specific outcome: "Today, I want to learn calculus"
Very specific outcome: "Today, I want to learn how to solve equations with two variables"
Stay focused on one task at a time - Research at Stanford has shown that focusing one single task at a time is far more productive than multi-tasking. Travis Bradberry has written that "The frequent multi-taskers performed worse because they had more trouble organizing their thoughts and filtering out irrelevant information, and they were slower at switching from one task to another. Multitasking reduces your efficiency and performance because your brain can only focus on one thing at a time. When you try to do two things at once, your brain lacks the capacity to perform both tasks successfully." Stay laser focused. Do your hard work first - If you want to let your analytical brain take over, do your hard work 2 hours after waking up. So, if your alarm goes off at 8, your peak focus times are 10 a.m. to 12 p.m.
Focus in short time increments - If you’re working throughout the night or sitting at your desk all day, you’re not helping your brain do its best work. It performs better when you space out your work. To focus more effectively, use a timer to work in one hour time blocks or for 25 minutes (the Pomodoro technique), then take a break: go for a walk, have a snack, run errands, prepare your next meal, or do a short burst of physical activity. Teach someone else what you learned - Teaching is not just for experts; it’s actually an excellent studying technique. Grab a close friend, then tell them the main points of what you read. Write an outline on a sheet of paper, explain the key concepts, and give an example or two of why they’re important. Ask them what they think and how they understood the material. You might even get a fresh perspective on something! Teach it to yourself as if you were a 5-year-old kid - Point 4 and 5 are related, but are not exactly the same. Whenever you learn something new, try to explain it to yourself as if you were a child, by using easy words for instance. This could also be done by using metaphors. You remember how I was talking about the flashlight analogy earlier ? That could be an example. Use power naps for a memory boost - A power nap can maximize your productivity by helping you memorize new information faster. When we’re napping, our brain is still busy and the hippocampus is getting supercharged. When we wake up, the hippocampus re-activates the neural firing pattern that was active during the learning process, making it easier to recall the new material. Finally, study with goals - A lot of people study with time: "I will work 3 hours on X, then 2 hours on Y". This is not a good method simply because time becomes your master. When doing this, you repeat the material you have studied, just because you said "I will work 3 hours on X" and therefore keep doing the same thing just to fulfill the goal of having studied 3 hours on X. Now, the good technique is to say: "today I will focus on X and learn about Y and Z" no matter how much time it takes. Sometimes, I go to the library for 15 minutes, sometimes 4 hours. It all depends on the difficulty of what you want to learn, your mood, your energy. Fulfilling the goals must be your objective, regardless of the time it takes. I honestly believe it is quite a shame that this is not taught in school. We only learn about new materials, but the first thing we should be taught as children is how to learn. To quote Mark Zuckerberg: "VR has the potential to be the most social platform". ​It opens a whole new world to visualisation: Gaming, Immersion, Movies, Experiences. A few months ago, I have had the opportunity to try the HTC VIVE on a stealth game. It was literally one of the best experiences of my life. It really made an impact on me. Since then, I have started learning deeply how to develop applications on it and have done a lot of research on how VR works exactly. Today, I will be explaining how Virtual Reality works, and will try to go deep into it from an engineering perspective. Virtual Reality tricks your brain into believing you are in a 3D world. The first way VR does this is with the stereoscopic display. This works by displaying two slightly different angles of the scene to each eye, stimulating depth. the image above is an example of the stereoscopic display. In order to create a life like experience, other techniques are developed. For instance, parallax defines the farther objects to the player seem to move slower, making it more realistic. As you can see in the picture, the angle of the weapon is slightly different on each side, as is the crosshair. Once you put the headset, everything lines up perfectly, as if you actually a real weapon in your hand. For VR to work convincingly, the person needs to feel completely immersed in an environment, but also have the ability to interact with it. It's the interaction - known as telepresence - that sets VR apart from other virtual world systems and 3D cinema. Moreover, there is the notion of feedback to be taken into account. When interacting with objects in real life, we can touch, pick up and feel the objects. It is referred as force feedback. 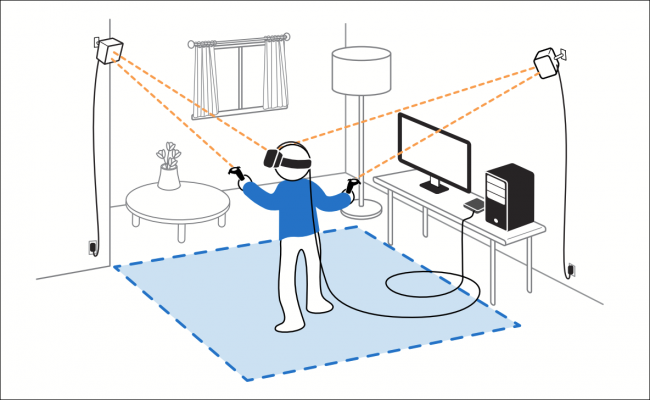 In order to create this in the VR world, things such as vibrating controllers have been implemented. They are called haptic systems. A very important part of VR is about tracking the movement and maintaining the illusion. Virtual Reality just wouldn't be Virtual Reality without the ability to look around. I mean, otherwise, the whole thing would not be immersive. Tracking a user's motion is nothing new in the world of computer technology. The mouse that you are currently using is already a device for tracking hand motion, a very simple one compared to an HUD like the Oculus Rift or the HTC Vive. A mouse could be described in engineering terms as a "two degrees of freedom" tracking device, since you can move it left-to-right and front-to-back across a desk. Mathematically speaking, it represents the x and y axis. Most VR headsets have at least three degrees of freedom: you can "pitch" your head by tilting up and down , "roll " your head from shoulder to shoulder, or "yaw" your head from side to side (for example to say "no"). A few even let you move around a physical room in three dimension (such as the HTC Vive), for a total of six degrees of freedom. The image above represents the tracking system of the HTC Vive. The trackers take some time to setup, but do the work efficiently. As you can imagine, tracking someone or something moving around in a combination of six different ways is more complicated than a mouse. One device for recording the kind of information needed is called an Inertial Measurement Unit (IMU). An IMU uses an accelerometer, a device like a miniature weight on springs for measuring forces in three dimensions, and also records linear movement as well as gravity. A gyroscope is used for tracking angular movements. Last but not least, a magnetometer - like a three dimensional compass - gives the orientation of the IMU relative to the earth. Combining the measurements of the different devices in a process called sensor fusion, an IMU can estimate how a device is rotated or moved over time. For VR to work, the illusion must be extraordinarily slick. Humans are extremely sensitive to visual inconsistencies; even small snags can cause "VR sickness" (also called Cyber-sickness), an affliction like motion-sickness. So images must update very quickly. That requires beefy computing hardware capable of generating 90 or more frames per second, also called FPS (standard TV, and most video games, target only 30 updates per second). And the sensors that track the user's head must be able to talk to the computer at least that fast: any delay can cause an unpleasant dragging sensation. Despite the difficulties, engineers are convinced that such problems have, at last, been banished. Different VR platforms also have different specifications on the headsets themselves. The HTC Vive and Oculus Rift both have 90Hz displays, while the Playstation VR has a 60Hz display. It is a rule of thumb that you want your frames per second to match your monitor’s refresh rate, so it is recommended that the Vive and Rift both maintain 90 FPS while the PS VR maintains 60 FPS. Mobile is a different story, as different phones have different resolutions, but maintaining at least 60 FPS is the goal. Expanding more on how FPS and refresh rate work, FPS and the refresh rate of a monitor are two separate things independent from each other. Frames per second is how fast your GPU can display images, per second. 60 FPS means that the GPU is outputting 60 images every second. The refresh rate of a monitor is how fast the monitor can display images per second, measured in hertz (Hz). This means that if you are playing a game and the FPS is 120 but your monitor refresh rate is 60 Hz, you will only be able to display 60 FPS. You are essentially losing half of your frames, which is not a good thing as “tearing” can occur. Tearing is the phenomenon of objects in a game breaking up into a few pieces and being displayed in two different locations along the X axis giving a tearing effect. As of right now, the HTC Vive is the most complete VR experience on the market. As well as a headset and two base stations (which are used for tracking the headset's movement) the Vive also includes two motion controllers in the box. This is important, since it allows the Vive to offer a much more immersive experience than using a traditional controller. The current VR arms race is all thanks to one man: Oculus founder Palmer Luckey. As a teenager, Luckey collected VR tech and was fascinated with making his own headset in his garage. Numerous prototypes and a $2Billion Facebook buyout later, Oculus is still the biggest name in VR. Now the consumer version of the Oculus Rift is finally out and we can get our hands on the headset that started it all. Powered by technology from Oculus, the Samsung Gear VR was effectively the first VR headset on the market. To use it, you simply grab a Samsung phone, download apps and games from the Oculus store, and clip it into the headset. The original model supported the Note 4, but subsequent models have expanded compatibility to a number of phones including the Note 5, Galaxy S6 and Galaxy S7. Below, you will find the specs needed for a computer to support VR. Actually, the majority of people who own desktops are unable to use virtual reality, as their computers are not powerful enough. 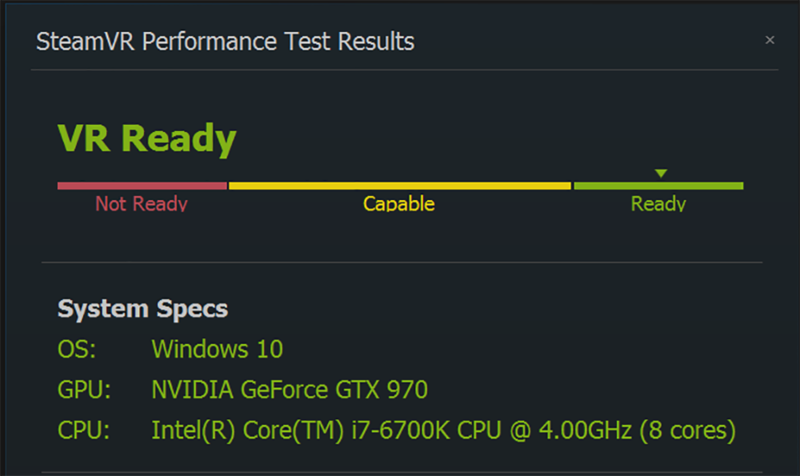 Steam recommends an Intel i5 Haswell or newer and either an Nvidia GTX 970 or AMD Radeon R9 290 for a smooth experience. I hope this gave you some insight on Virtual Reality and how it works. Computer Science Masters student with a passion for Machine Learning & Visual Computing. Most of all, I love learning new things!